This is the story of the moon, who was quite the braggart. This moon was so delighted with himself that he boasted continually of the great light that he shown down on the world at night. He sang songs about himself ("Blue Moon", "Moon River", etc) and praised himself for being able to cause the sea 'to rise and swell each day.' This moon was quite full of himself and he is illustrated in such a way as to make him seem even more of a goof ball. Then, "one day a piercing ray showed him a shocking sight." The sun makes its first appearance in the book by sending a ray of light towards the moon and suddenly the moon realizes just how prideful he has been. He realizes that he does not produce his own light, but he reflects the sun's light. Is what he loves the most. The Sun is now his boast." This fantastical and whimsically illustrated story is a great parable for children, reminding them that life is not All About Them. It reminds children to think of the One who gave them their gifts and talents, encouraging them to deflect praise and, instead, redirect it to the One who is most deserving of it. 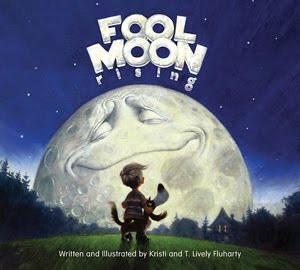 Fool Moon Rising is a simple story with a big message. Kristi & T. Lively Fluharty did an excellent job illustrating the moon's expressions. At the beginning we are met with the cheesiest of grins and by the end of it, the moon is accurately redirecting praise with pride being shown towards the sun. It's hard for me to explain, but they really did a very good job at capturing the emotions and struggles that the moon had and portraying a change in his mood so well that it is hard for even my almost three year old to miss the message. He has requested this book over and over again this past week and I have been happy to read it to him everytime he's asked. Fool Moon Rising is a beautiful book with an important message and we are very much enthralled. To find out more about the book, check out the Fool Moon Rising website which contains more information about the book, tells you a little of the authors and allows you to preview it. I highly recommend that you do! I offer my thanks to Crossway for this one! Five stars, lots of thumbs, fingers and generally loud cheers. If it's that good, you might want to nominate the book for a Cybil award. Anyone can nominate, and nominations are open now.